My husband and I have been trying to carry out this advice ever since we read the book a few months ago and, I must report that for some reason this is very HARD to do! Imagine you are eating and enjoying a delicious meal. There are two bites left, but you start to feel full…what do you do? I start to have a little battle in my head trying to force myself to just leave the last two little delicious bites alone. Is it enough food for me to save? I don’t want to waste it. Shouldn’t I just finish it even though I know my stomach is starting to feel full? I have only succeeded in not overeating (beyond 80% full) about half of the time that this has happened. I have mentioned before that when you start to eat real food you fill up faster. When you eat processed foods that are mostly high in calories/energy and low in nutrients you need to eat more to get to that feeling of being full. So not only is it important to listen to your internal cues when you start to fill up, but it is also important to adjust your portion sizes accordingly (especially if you are eating real food). I have found that serving myself the appropriate amount helps tremendously to ensure that I also eat the right amount. So the next time you serve yourself a meal, try starting with a half a sandwich or burger, or even just a kid plate amount of food. You can always go back for seconds! While it is unfortunately true that buying real food can cost more than the processed stuff, it certainly helps your wallet if you only buy and eat the right amount of it. I like this blog a lot. It is dealing with every day issues we all face. I find a good cue is when you begin to eat slower–then you are full. My mother kept us thin by serving smaller portions. Then we actually finished our plates and my mother didn’t feel she was being wasteful by throwing out the left over food on our plates. Your mom was ahead of the times! I agree that it’s so hard to push the plate away when eating a yummy meal, and I hate to feel wasteful. 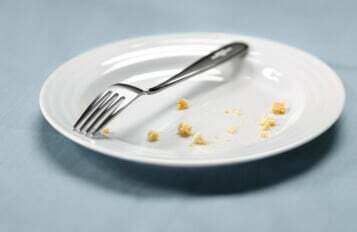 I heard or read a comment recently that I’ve tried to keep in mind and have found it somewhat helpful: the next bite(s) will taste the same as the first, so is it worth the added calories and potentially feeling miserable to clean the plate? That is so true…and the times where I have saved even a few small bites of something good I was glad to have another taste of it the next day! Oh, I despise the “clean your plate club”! I think it definitely teaches our kids to over eat and to avoid their body’s cues that they are done. I can’t tell you how many times I have heard parents say, “Well if you don’t finish your dinner you can’t have dessert.” So, what does a kid do…stuff themselves just to have something else that’s not always so nutritious. Oh, boy. Do I hear you. My HB and I both always clean our plates. Bad habit. Plus, after this many years I just can’t stop until it’s all gone. However, with our kids, I always let them stop when they say they are done. Provided they’ve given it a good try, eaten at least some of the veggies, and aren’t going to ask for dessert in two minutes. If I feel like they really just didn’t like what I served (I don’t make two meals, so they may just barely touch a stir fry) I will give them a big bowl of yoghurt and fruit. I’ve just switched back to plain yoghurt. The sugar in the other is just insane. Totally agree!! The phrase that was beat into our heads when I was a kid was “Just get a little bit, you can always get seconds if you’re still hungry”. I try not to worry about those “last two bites” because I know that they are perfect for some other use. Usually, I add it to my lunch bento. Normally a couple bites or spoons of leftovers are perfect for bento meals. No waste, and no reason to over eat when I know I can munch on it the next day (and thereby prolong the enjoyment). THANK YOU! I always get so much crap from people about how “wasteful” I am when we go out to eat and I don’t clean my plate. Well I’m full! I can’t control the portion size the restaurant gives, and I’m not gonna make myself miserable just so you can feel like I didn’t waste anything. You spent the same amount of money whether it’s in my in my stomach or in the trash! Food being thrown away is wasteful, period. You may not have spent any more money on it, but that is food that is not being eaten by someone and is instead going in the trash. Next time, order something that comes in a smaller portion size, ask the waiter if they can do a half portion, or order what you would have ordered and have the excess wrapped up for tomorrow. Someone once told me that gluttony is far more wasteful than composting. I too admit I clean my plate, but as the cooking the house I really try to make our portion sizes fit our needs. Last night for example I made a meal with enough leftovers for my wife and I for a few meals. I could have easily had a second serving but refrained because I knew in a few minutes I would be completely satisfied with my portion. We’ve learned to eat so much more than we need as a society and couldn’t agree more with the mentality of this article. Thanks for posting. I have been struggling with this all my life. My parents and grand-parents always made us clean our plates. And still today, i feel the need to finish everything on my plate even though i may already be full or i may not even enjoy the meal that much. and it’s so hard to change. i try not to make the same mistake with my 2 sons though. I’ve switched to sandwich or salad-sized plates for all of my meals. That way, I get the visual cue for less food, and never feel like I’m wasting food. My husband is a huge “clean plate” follower, to the point where if I am full he will clean my plate for me. I started serving dinner for us and leaving the leftovers in the kitchen (not on the table). I start off with giving us both smaller equal sized plates (instead of before where I gave him more food because he is bigger and in my mind, hungrier). Now, he still cleans his plate, but I know it is an appropriate portion size. Like the article states, if we are still hungry we can have seconds. Usually finding the motivation to get back into the kitchen is enough to keep us satisfied with just one plate. I do believe in finishing what is on your plate – don’t waste food. But know yourself and start off with a little food and take seconds if you are truly HUNGRY. I agree with not forcing your children or yourself to finish your plate if you are full, but I don’t really think that is one of the causes of obesity. Obesity does not come from eating a few extra bites off your plate. It comes from way worse eating habits than that – eating EXTRAORDINARY amounts of food, and poor quality, high fat, high sugar foods (as well as indulging in a sedentary lifestyle). “Clean your plate” was a practice of previous generations, but it’s OUR generation that struggles with obesity. My parents practiced “clean your plate”, but they are not in any way over weight, because their food is healthy to begin with, they don’t go back for snacks an hour later and they exercise regularly. If anything, it is the parents of our generation that have become way more lax and less restrictive about food (I often see parents let kids leave half-finished plates) and yet we are the ones struggling with obesity. I think the key is discipline. Our parents were disciplined about their eating habits, including not eating too much, not snacking, eating homemade food, AND cleaning their plates. Our society has become way too indulgent about food – eat whatever you want, as much as you want etc. It would be better to “clean your plate” but eat healthy then to not finish your plate but eat junk. I agree with you, Nadine. I put the amount of food on my kids’ plates that I know will satisfy them, without stuffing their bellies. One always eats the food, while the other two will say they are “full” after one or two bites because they don’t want to try the food or eat the food. Eating massive platefuls of unhealthy food every meal for a long time will cause health problems, but expecting children to eat a reasonable amount of healthy food at mealtimes is not a bad thing. I see nothing wrong with “clean your plate” as long as it doesn’t go too far, i.e. the child is becoming physically ill trying to force themselves to eat a food they really and truly hate. I agree, and when I think back on the times when my parents encouraged me to finish my plate, it was almost always vegetables left. My parents never had to force me to eat the last of my lasagna or pizza. What kid wants to eat a cold piece of broccoli or kernels of corn they’ve been shuffling around their plate? Unfortunately veggies are the most important part of the meal. Sometimes if we’re eating something like a chili or soup, and my daughter hasn’t eaten much or doesn’t like it, I just scrape it back in the pot with the rest of the leftovers. We don’t care. I try hard at this one too. I never make my kids clean their plate just for the sake of cleaning their plate, I make a judgement call at every meal, based on how much I know I gave each child, and what else I know they’v eaten that day, and how much I know each child can/should eat. No two children are alike. Some days I will make some children finish their meal, but usually not. The only time we really require it is if there is dessert offered (which is rare), and on those days I really try hard to give them what I think is a reasonable portion for each child to finish. I actually never make (or made) my kids finish their food. But when they were old enough to understand, I started telling them “this is dinner time, no more eating after this” as I started feeling like a short order cook. I learned from my kids that you naturally moderate your intake. That sounds so silly,but I was amazed that kids will eat what they need. I grew up having to finish what is on your plate and I have the shape to show for it! My kids don’t even overeat with dessert! I still get a little tripped out by it! I agree that it is about judgment. I do not have a hard and fast rule that my kids must always clear or never clear their plates. However, I do not allow eating just the main dish and not touching the vegetables. Also, the rule for my daughter is don’t ask for more of anything until you’ve eaten everything you were given. I have a pretty good idea of how much my kids eat. They both are very good eaters when the meal is something “normal” such as bean burritos and often ask for seconds. BUT when I put something I make less often or that is new they eat a lot less. I also noticed that my one and a half year old son is starting to pick up cues from his four-year old sister. If she is picking at her food, he may resist tasting it. I do not believe that my big eaters are done eating after two bites of food. That being said, I can’t force them to eat. But I do refuse to give them anything else to eat in place of their dinner. I always try to leave a few bites at the end as the dog gets a treat. I have also bought smaller dinner plates!